On a recent day in late October the mayor of Johnsonville was setting up a 125-gallon aquarium, which would eventually host a pair of bala sharks, a catfish, three oscars and live coral for real-life science lessons on saltwater habitats. 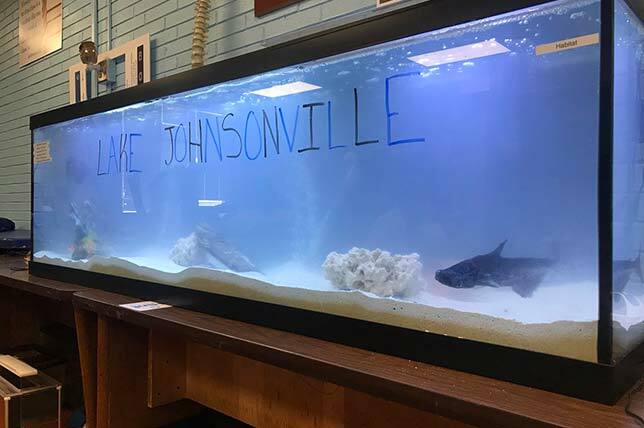 Anthony Johnson's fourth and fifth graders at Isenberg Elementary School in Salisbury, NC refer to the tank as "Lake Johnsonville." Bringing the real world into the classroom is something a lot of teachers are trying to do. It's something Johnson specializes in. His students are issued funds when they become residents, then they're expected to pay bills, find work and learn by doing projects. And the mayor is a stickler for keeping schedules, so his students learn how to work with Google calendars to maintain their obligations and appointments. Earlier in the day, a student was waiting at home with his district-issued iPad, ready to connect Johnson to his mom for an online parent-teacher conference. "That kid set a reminder. He knew at 11:10 we needed to be on that [video] call," said Johnson. "When I turned it on, he was there waiting for me." Project-, problem-, big-picture, or competency-based learning all describe movements afoot to immerse students in authentic experiences, which proponents of PBL have long heralded as the route to deeper learning. The challenge for teachers, of course, is coming up with those engaging lessons. At Isenberg, Johnson relies on a school subscription to DefinedSTEM, a repository of resources that lays out the basics through videos, then provides experiments and projects — "performance tasks" in DefinedSTEM lingo — for students to follow as they learn new concepts. "Everything is there for the kids," Johnson said. "It's great because I'm not the teacher doing that problem-based learning. I become the facilitator." Tapping into young people's interests in how the world works is just one ed tech practice we see on the rise. But it's not the only one. This article explores how a handful of trends — adoption of virtual reality, growth of making, a bigger emphasis on computational thinking and continuing concerns about the protection of school data — are evolving in new ways that we believe will dominate education conversations for the rest of the year. Sure, there's plenty of talk in schools about how virtual reality (and its lesser-used partner, augmented reality) can deliver experiences to students that they might not otherwise have. What's beginning to bubble up more frequently, however, according to Chelsea Waite, program director for global learning at Digital Promise Global, isn't so much the consumption as how students are making use of new technologies "to be creators." Waite is one of the leads behind the 360 Filmmakers Challenge, a program that works with Oculus to outfit schools with VR technology, including headsets and cameras (as well as basic training), and then encourages students to make videos on topics that matter to them. As a result of the filmmaking projects, the organization explained in a report issued earlier this year based on surveys and interviews with teachers and students, participating teens gained technical and creative production skills, got exposure to new career possibilities, increased their abilities to take in the perspective of others and improved their abilities to communicate and work on teams. Just as important, the survey found, the projects had "personal importance' for the students; and those who made the videos found the projects "more interesting" than other school work. Waite insisted that high-end VR gear isn't needed to spark usage in the classroom. As the equipment — both headsets and cameras — come down in price and free and cheap smartphone apps are developed that allow for virtual world creation, "there are increasingly easy entry points from the production perspective." In 2016 Digital Promise teamed up with Maker Ed to issue a pledge called the "Maker Promise" to school leaders and teachers, urging them to dedicate space and resources and time to the concept of "making" — activities in which the student does design and creation of physical or digital objects. That kind of hands-on education as a movement in schools has been around for as long as CTE and vocational classes have existed. But somehow, according to Josh Weisgrau, program director for maker learning at Digital Promise Global, we've set the maker movement apart as a distinct entity — something done alongside other programs of study. As 2018 unfolds, we're going to start seeking a clearer distinction "between the maker movement and [making] in schools and in education." The shift, he explained, will be from "learning about making to learning through making." As a result, making will begin permeating all curriculum, as another great tool used by teachers for helping to personalize the learning. "Not every teacher is going to be invested in creating the next generation of makers or engineers," Weisgrau added. But they're all invested in figuring out how best the students in front of them "learn as individuals" and the different ways they can help those students access the content or domain they're trying to teach. In the latest Hour of Code, tens of millions of students spent at least a little bit of a December school day learning about programming at classroom events around the world. Tutorials by Code.org were made available in 45 languages. But that's just the start, asserted Waite and Weisgrau. What we can expect to see more of is a greater emphasis on computational thinking. "Coding is the ability to manipulate the tool that computers use," Waite said. "Computational thinking is about how you as a person direct and manipulate the technology around you." Learning how to approach problem-solving from a systemic point of view enables students to strengthen their abilities to work through logical processes, analyze data and use systems thinking in all kinds of endeavors, not just programming. One driver is the Next Generation Science Standards, which embeds the concept alongside math at all grade levels. For example, elementary students are expected to be able to demonstrate computational thinking by collecting and analyzing data tied to physical properties; middle schoolers use the same skills to explain how matter is conserved when substances change; and high schoolers apply it in energy-related calculations. In the last four years, according to the Data Quality Campaign, 94 additional laws have been passed on safeguarding the privacy, security and confidentiality of student data. Securing student data is the topic that seemingly won't die. And according to Sara Kloek, software industry association SIIA's director of education policy, programs and student privacy, those discussions are "never going to go away. People want to make sure that students are protected in all aspects in the classroom." What will be truly novel about the topic in 2018, however, is acknowledgement at the federal level about how confusing the various regulations are — especially FERPA, the Family Educational Rights and Privacy Act, which has been around since 1974, and COPPA, the Children's Online Privacy Protection Act, which was enacted in 1998. Kloek, who formerly served as senior privacy and technology fellow at the U.S. Department of Education in the Office of the Chief Privacy Officer, said she was looking forward to attending a joint workshop, "Student Privacy and Ed Tech," co-hosted by the U.S. Department of Education, which oversees FERPA, and the Federal Trade Commission, which is in charge of COPPA. The goal is to clarify and untangle the intersection between the two regulations and how they can protect students without interfering with the promise of education technology. One potential outcome from the workshop, suggested Kloek, could be a greater motivation for schools and districts to get more proactive in communicating with parents and students about what they're doing on privacy. "It's hard. Public schools are required to send out the annual FERPA notice. I'm curious [about] who's doing it well and whether parents are happy about the way things happen," she said. "This is the first time where it's going to be discussed out in public. It's a conversation that's needed to happen for a while. Bringing all the stakeholders to the table is an important step." While technology provides a pipeline in education to the world and its riches of digital content, it can also be taken advantage of by "those with the most heinous views in ways that are fundamentally pretty threatening," warned Doug Levin, president of consultancy Ed Tech Strategies and former executive director of the State Education Technology Directors Association. It doesn't help that cybercriminals have decided districts are low-hanging fruit for plucking personally sensitive data. "Schools have lots of things connected, but they don't have a lot of IT support. They're not always running the latest and greatest equipment. And so that makes them a target of opportunity," Levin explained. At the beginning of 2016, Levin began tracking cybersecurity-related incidents reported about U.S. K-12 public schools and districts. As of the end of November 2017, he has added 234 security-related events to his "cyber incident map." What's particularly "scary" about the break-ins these days is not simply the loss of personal data, he added, but how some criminals have sought to attack schools "specifically because they are places where lots of kids are, and they're interested in making political points." For example, a number of Los Angeles and Ventura area school websites were hijacked in 2017 to display pro-ISIS propaganda. More alarming, in October, a district in Iowa closed several schools after parents received text messages that threatened the safety and security of their children; some believe hackers stole personal information from the district network. The fact that nobody else was doing this security tracking in such a focused and methodical way before Levin took on the challenge indicates just how immature the education field is when it comes to cybersecurity. "We know so little about the nature of threats that it's still in a place where we believe the world is flat," he mused. "We don't really understand the nature of threats — how they change over time, what steps districts can take to protect themselves. If you don't understand the nature of a threat, you can put in place all sorts of policies or buy all sorts of technology, and it turns out you're buying the wrong stuff." That lack of maturity also surfaces in how data breaches are communicated to those affected as well. Levin cited a situation in Texas in which numerous districts had their employees' names, Social Security numbers and other data exposed on a website managed by the Texas Association of School Boards. Rather than coming clean as soon as possible about how many people were affected and from which districts, every time a news story appeared, the information was updated, as if one district didn't know about the break-in that occurred in the next district over. "It's the classic wrong way to get bad news out there," said Levin. "There may be a need for guard rails, but it's not clear who gets to set them and how they get set," Levin acknowledged. "It may be that all this connectivity is not an unabashed good." Google rules. The company's dominance in schools is hard to ignore, Doug Levin pointed out. Ed tech companies make sure to tout their Google integration; Google Chromebooks account for more than half of school-purchased mobile devices; and now Google Classroom has found a firm foothold in helping manage operations of the digital classroom. Google is "playing with lots of other ideas right now. But it has snuck up on us. And I think it's hard to understate how pervasive their influence has grown," he said. E-rate modernization under attack. The FCC has opened up proceedings on E-rate, raising questions about provisions of the modernization orders put in place in 2014, Levin said. A main area of interest is self-provisioning of dark fiber — districts applying E-rate discounts to deploy their own fiber networks when they can't get the speeds they need or can't get them at "reasonable cost" from area internet service providers. As Levin explained, the FCC has "put a real cloud over whether or not that E-rate funding is going to continue being available. "They've held up people in building this out. There are questions about whether or not that money will remain available for folks — or might even get clawed back." Videoconferencing will connect more students. Whether it's Zoom, BlueJeans or something else free and easy to set up, teachers are using video feeds to put students in touch with each other beyond classroom walls. At "Johnsonville," for example, every Wednesday, Anthony Johnson's kids sit in on sessions with educators, professionals and classes around the world. "Three weeks ago, we did a science experiment with a fifth-grade class in Ireland live," he recounted. "It was awesome." Trust will continue taking a beating. It's been a hard year for experts. Trust in online content, news sources, platforms and institutions is at a low point. Training in media and digital literacy to assess the quality and veracity of information has never seemed more important. Those same literacies need to be applied in assessing the use of new technologies themselves, asserted Chelsea Waite. "Who is empowered and who is not?" she asked. "Technology is not neutral, and people made decisions to design it in a certain way." Therefore, added Josh Weisgrau, helping students develop critical mindsets can become a virtuous cycle. Computational thinking, making and the use of virtual means to learn about the real world is a continual reminder to students that "everything around them was created by somebody, and that therefore they can design it or redesign it in a better way."